October 19 was the first day of operation of the Smart Yards Cooperative, an innovative new enterprise based in San Jose to conserve water by replacing existing lawns with California native and drought-tolerant plants. “Smart Yards is a holistic solution that saves on water, energy, time, maintenance, pollution, and costs for the homeowner”, states Project Director and co-op founder Elizabeth Sarmiento. Elizabeth and her husband, homeowners in Willow Glen replaced their front and back lawn into sustainable landscapes in 2008 which significantly reduced their water consumption. Elected officials including Senator Jim Beall and San Jose City Council member Ash Kalra recently helped launch Smart Yards, highlighting the urgency of water conservation and sustainable landscaping practices. Homeowners may be eligible for a rebate from their local water district to help convert their lawns into sustainable landscaping. Smart Yards is set up to create healthy, bio-diverse yards by using intelligent landscaping designs, permaculture principles, non-toxic and reusable materials, native and drought-tolerant plants that are children and pet friendly, Zen and rainwater gardens, edible food and herb gardens, greywater installations, and amenities such as raised beds, chicken coops, fruit trees, composting, and spaces for fun and relaxation. “The landscapes don’t require mowing or blowing, which cuts down on dust allergies, noise pollution, and maintenance costs”, states Sarmiento. 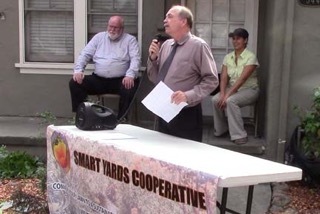 The Smart Yards Cooperative can be reached at408-665-2621, smartyardscoop@gmail.com, orsmartyardscoop.com.